If ever a drummer summed up a band's sound, it's Tre Cool. 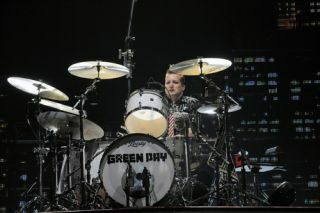 His bull in a china shop approach perfectly suited Green Day's attitude-drenched early days, while his hard and heavy yet restrained when needed latter day style is matched by the more mature sound found on the band's more recent output. This week the pop punk brat upstarts turned stadium rock heroes kick off a trio of enormo UK dates, reinforcing their position as 21st century rock superstars. In recognition of their undoubted standing, we're looking back at Tre's finest moments behind the kit. For many, 'Burnout' served as an introduction to Tre's unmistakable drum style. The opening track on breakthrough album Dookie in two minutes encapsulates what was to come for the next 16 years. A breakneck verse brought to life by a flurry of tom rolls. Check out this live video from the band's infamous, mud-filled Woodstock 94 performance to see the first steps of a soon-to-be drum megastar. Arguably still the band's signature song, Tre judges this one to perfection. From the barely noticeable (but oh so important) hi-hat in the intro through to the snare-crash trade offs that punctuate the track, this is Green Day at their mid '90s punk brat best. Another cut from 1994's Dookie, here Tre goes all mature on us with a restrained tribal-esque tom driven verse, before showing his true colours once again with a pulsating chorus that's all about ear-splitting crashes and pounding snare smashes. After a lukewarm reception to Dookie follow-up Insomniac, Green Day needed success with 1998's Nimrod. Tracks like 'Hitchin' A Ride' showed that they were well back on track. Led by Tre's delicate (well, about as delicate as you can get with Tre Cool) snare-filled verse and crash-laden chorus, this is so punky it's dripping in snot. After a commercial lull, Tre and the boys jumped back into the arms of the mainstream with American Idiot. The title track shows that mellowing is a million miles away from their minds, as its stop-start verse flits between a breakneck beat, bass pedal beats and a simple tom pattern. Check out the awesome promo video for proof (if any were needed) that Tre and the boys still have what it takes to blast out a three minute slab of punk perfection.